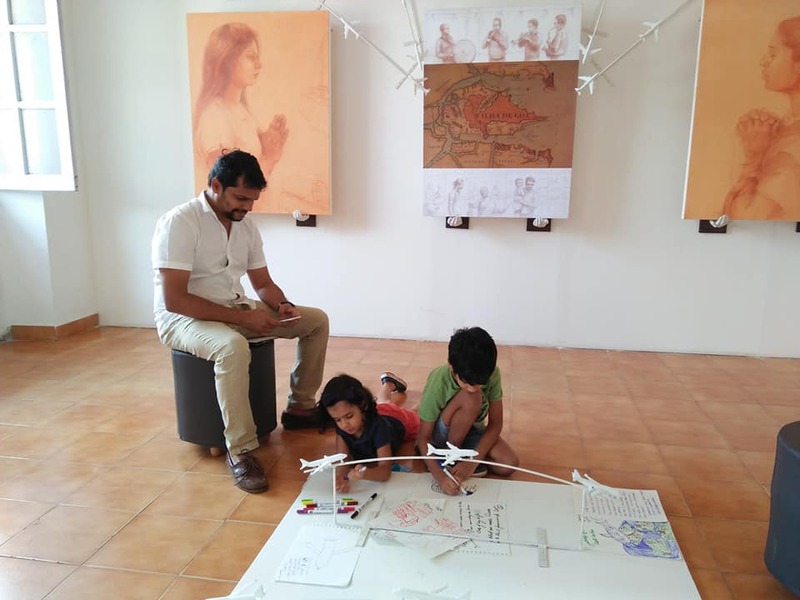 Loretti J. Pinto is an emerging artist from Goa, with a BFA in painting from Goa University. 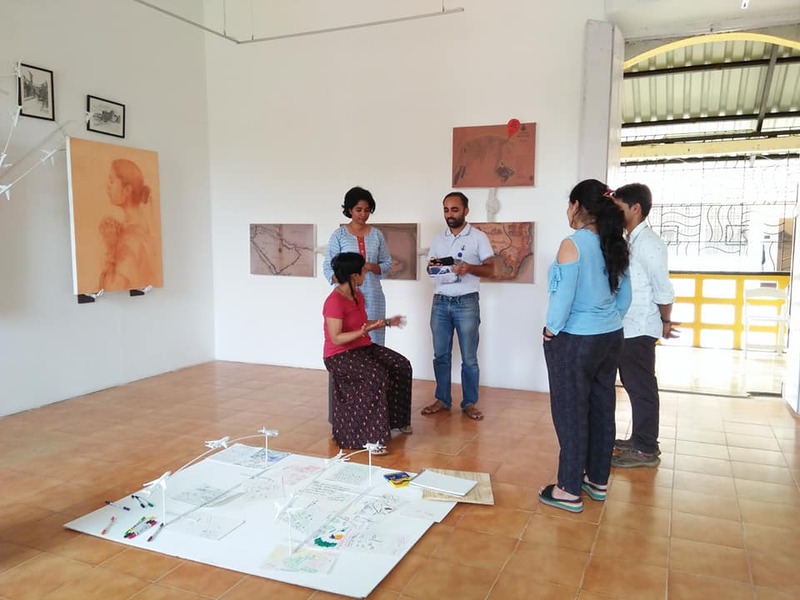 Her work has been exhibited regionally and nationally including a showing at the 7th Bharat Bhavan International, Biennial of print art, 2006, and at the exhibition titled ‘Explorations’ for the National Museum for Women in the Arts in 2005. Konknnichea molleant, the artwork by Loretti Pinto, is a significant and powerful metaphor for how weaving transforms conflicting ideas in our minds. The Aztec philosophy calls weaving a cathartic activity, and elaborates that weaving begins with fibre-dried grass stalks, bunched together into two groups, warp and weft. Deft hands interlace warp and weft, transforming previously loose chaotic threads in dynamic orderly tension. The weave is a balancing construct that brings meeting of two separate things and the creation of a new entity (mat). Weaving is the organising metaphor of the cosmos, an unceasing process of creation and destruction. It transforms and unites two opposing forces which compete yet complete each other. For example - male and female, dark and light, weak and strong & life and death are few of countless opposites that struggle for dominance in our lives. Thus, there is no death without life, nor creation without destruction. No half, ever triumphs over the other, for both opposites are necessary for existence. Loretti’s body of work straddles binaries. For the artwork Chondrimachea Talar, Udkachea Nadar, Manxechem Dar II there is an opposing yet complementary work, Building China at the cost of my homeland. The former patterns rhythms of nature - growing vegetation, cycles of the moon, the tides determining the opening and closing of sluice gates bordering the fields. The latter disrupts the natural rhythm, portraying interference with nature wrought by man, the mining of iron ore - drilling cyclical patterns into earth by machines, denuding and exposing its innards to yield a raw material to build skyscrapers in another part of the world. with charcoal, pencil and conte crayon. Houses of Goa effectively contrasts with Dolleam add mosonn padd. 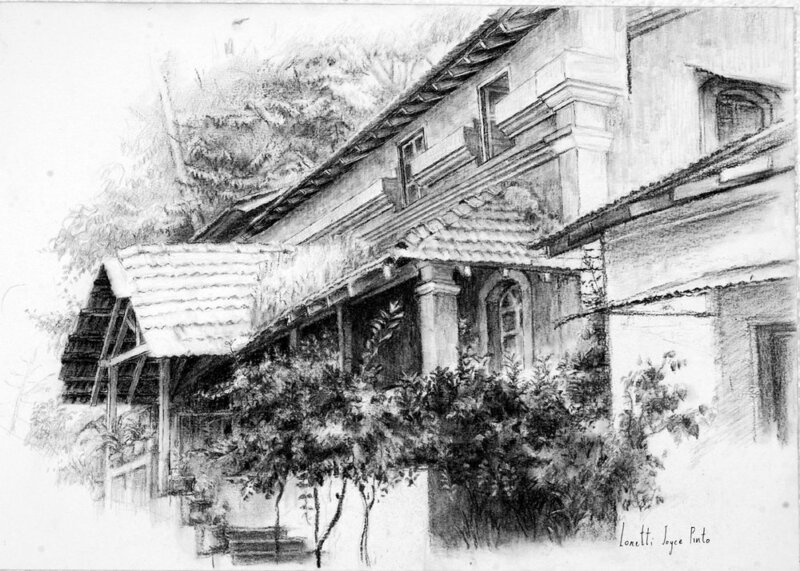 In Houses of Goa, Loretti has chosen to work with charcoal and graphite over a hue of colours that mark homes in the Goan landscape. This selection using clear lines marks these houses as stark poetic frames imbued with an inner energy, rendering them vigorous and vibrant. The lines are flush with energy and radiate warmth that follows the steps leading the way into more lanes and by-lanes of energetic play. The aerobicised homes topped with parachute roofs seem lusty and beefy, housing a people in fine fettle. Uncompromising and forceful in their robustness, they relay a commentary on the state of its inhabitants as harmonious, hearty and gay. Loretti then unconsciously interlocks Dolleaum add mosonn padd, executed in charcoal and conte crayons, with a poetic strain that is bleak and forlorn. Lured by distant lands and better economic opportunity, the inhabitants of Houses of Goa have left their homes. Without an inner beat, the rhythm within the four walls of the houses has died down. Once open-ventilated homes are now cross-barred with rods and heavy locks. Lacking human touch, nature has gone its way - decomposing and crumpling what once was hardy and strong. Snaking roots now split walls and erode the very foundation of these abandoned houses, strangled by litigation and court litanies. Yet again with graphite and charcoal, Loretti sketches a portrait of a people who have an innate connect to their land and resources. Tapping into the stylistic device of synecdoche in art (where one specific component represents a whole), she carves out two pairs of big beautiful hands at work, mixing mud. These hands are voluble, expressive and clear about their task in life. Coarse but caring, scraggy but serving, not refined but spiritually defined - these hands till, sow, nurture and grow discerning generations. However, with changing world economics indicting the landscape, along comes the competing artwork - Merry we go around. Here the beautiful hands have been substituted by four long metallic talons, extensions of powerful machines that claw the earth, extracting its treasures for consumerist delights. The hands which worked ceaselessly in tandem with natural resources, are now competing with talons working exhaustively, destroying the natural reserve. Creation juxtaposes with destruction; one is necessary for the other to exist. The piece de resistance in this series, Flight to Paris singularly juxtaposes agonistic unity, where the warp is woven with the weft to create a balance. Two opposing forces stretch the canvas in opposite directions, a push-pull, which balances the artwork. The gaps between people standing in front of the airport ticketing counter are balanced by interlinked arms of the fishermen. 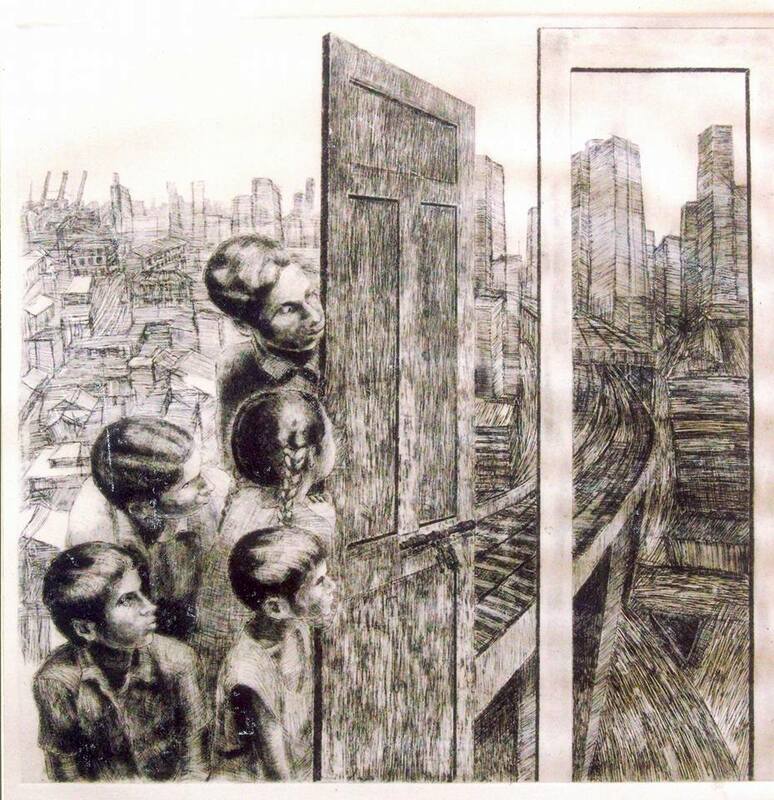 The third painted dimension, a line-up of young friends in arms with eyes riveted to flying aeroplanes, is the objective eye that observes and assimilates the situation of migrant and local, as each individual will choose their path when the time comes to set forth on their life’s destiny.